What Day Of The Week Was January 10, 2003? 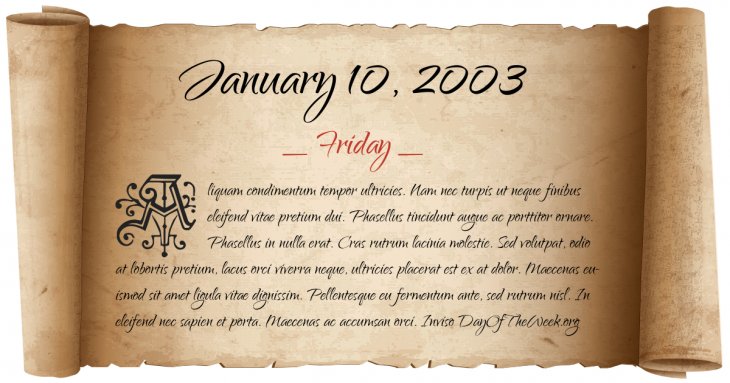 January 10, 2003 was the 10th day of the year 2003 in the Gregorian calendar. There were 355 days remaining until the end of the year. The day of the week was Friday. A person born on this day will be 16 years old today. If that same person saved a Quarter every day starting at age 3, then by now that person has accumulated $1,212.25 today. Illinois Governor George Ryan commutes the death sentences of 167 prisoners on Illinois’ death row based on the Jon Burge scandal.